Monarch kits are an excellent choice for cleaning up and concentrating DNA after enzymatic reactions and from agarose gels. Highly-pure DNA is ready in minutes in volumes as low as 6 µl. Monarch kits are designed with sustainability in mind and buffers and columns are available separately for added convenience. 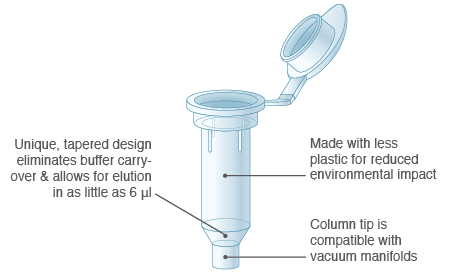 Not only are Monarch columns designed to use less plastic, but they are also optimized to eliminate buffer retention; Monarch columns are designed without a retaining ring, thus preventing salts from carrying over into your eluted samples. The tapered design of the column also enables low volume elution (≥ 6 µl). Monarch kits enable efficient purification of highly-pure and highly concentrated DNA from enzymatic reactions and agarose gels. Purified DNA is ready for use in downstream manipulations such as ligations and restriction digests. The Monarch PCR & DNA Cleanup Kit protocol can be modified to enable the purification of ssDNA, oligonucleotides, and other small DNA fragments. The Oligonucleotide Cleanup protocol efficiently removes unincorporated nucleotides, short oligos, dyes, enzymes, and salts from labeling and other enzymatic reactions. The modified protocol utilizes the same columns and bind/wash/elute workflow of the Monarch PCR & DNA Cleanup Kit with > 70% recovery and cleanup of oligonucleotides ≥ 15 bp (dsDNA) or ≥18 nt (ssDNA). Recovery of ssDNA and dsDNA oligonucleotides (1 µg) using the Oligonucleotide Cleanup Protocol and the Monarch PCR & DNA Cleanup Kit. I often purify small amounts of inserts for ligations, so I appreciate the ability to elute in small volumes. I also very much appreciate the reduction of paper and plastic waste.